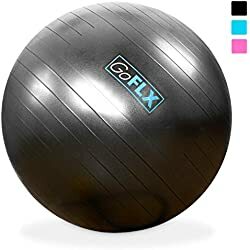 Besides developing good overall muscle tone for your entire body, the ball provides numerous other benefits that range anywhere from rehabilitating back, hip, and knee injuries to delivering a powerful workout to improve core stability, posture, and muscle balance. You also improve your flexibility and your cardiovascular system by using a low-impact workout. Training with the ball is fun, easy to use and it’s inexpensive and productive. The core is made up of the deep abdominal and back muscles that stabilize and support all your movements. These muscles are the ”deep” muscles because, although you cannot see them, they maintain the core stability in your body. These muscles work together to protect your spine and help with everyday activities. Lifting, throwing, bending, reaching, and running use the stabilizer muscles, so keeping them well-conditioned is extremely important. Without conditioned stabiliser muscles, simple movements like pulling, walking, and running go unsupported and leave you at risk for injuries. Training on the ball is one way to work this group of hard-to-reach muscles. 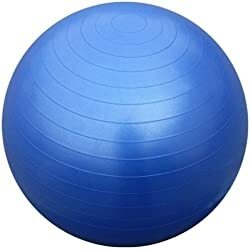 Just by sitting on the ball, you’re able to active the stabilizer muscles and not only improve your posture, but also feel more in touch with your centre of gravity. When you sit on a chair or a weight bench at the gym, you certainly don’t use any of these stabilising muscles that your body calls upon while you’re working out on the ball. For training your core on the ball, the rule of thumb is: The further away the ball is from the core of your body, the more difficult maintaining your balance is. For example, when doing a push-up on the ball, placing the ball underneath your lower legs makes doing the push-up much easier because the ball is closer to your core. To increase the difficulty, all you have to do is roll the ball out to your feet so it’s further away from the centre of your body, and so maintaining your balance is harder. When one muscle group is stronger than its opposing muscle group, this causes a muscle imbalance. Muscles that need to work together to perform a particular task, such as the triceps and biceps, are good example of muscle group that can have a muscle imbalance. Most people tend to over-train their front muscles of the body and neglect their posterior muscles, which can create bad posture and additional imbalances. The ball can improve muscle strength and endurance in all of the major muscle groups. Training with the ball can improve muscle tone, increase muscle endurance and strength, restore or improve flexibility, enhance spinal stability, complement your resistance and aerobic training programs, help you lose weight, and improve your balance, posture and coordination. Selecting a stability exercise ball is simple. 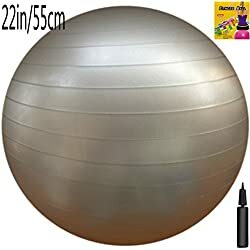 A properly sized exercise ball will allow you to sit on it with your knees and hip at 90 degrees. Using different size balls will allow you more flexibility and variation with your stability ball training. By replacing your bench with the ball you can add a whole new level of coordination and balance to your seated and lying exercises; not to mention the great core muscle strength and endurance you develop from stabilizing your body during all of your sets and repetitions.